The following apps have been reviewed and recommended by Reading Rockets. The price (free) is current as of 2/6/2014. Simplex Spelling Lite is designed to improve spelling and reading skills in a fun and interactive way by using "reverse phonics." Simplex Spelling Lite contains over 50 high frequency English words; it also enables students to build on each word, which goes above and beyond the sheer memorization of words. Simplex Spelling Lite enhances understanding in a variety of students as it appeals to audio, visual and tactile learners. It is a great tool to have for kids learning to spell, remedial students, or those learning English as a second language. Chicktionary is a chicken themed spelling and vocabulary-building word game. Children create as many words as possible out of seven letters. Completed words can be tapped to view their definition. There are multiple levels and children can choose a timed or untimed mode. *Note: This is a noisy app — incorrect words receive scolding squawks. The Mad Libs app is just how you remember the classic fill-in-the-noun/verb/adverb game, but with a twist! Fill-in-the-blank sections are now interactive, and hints are offered to educate and entertain. 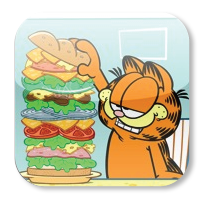 Professor Garfield Fact or Opinion is part story, part game, and part online safety lesson. When Garfield's friend receives an "F" on his report about goats for using opinions instead of facts, Professor Garfield steps in to explain the differences between a fact and an opinion (particularly with regard to the Internet), how to read with a questioning mind, and how a fact can be verified. Developed by the Virginia Department of Education. The Electric Company Wordball is a phonics game that integrates video clips from the TV show to teach reading and spelling. The game consists of two parts: watching a video about a letter sound or letter combination and tapping the "wordballs" with the featured letter or letter combination; then using the collected wordballs to complete words as they move across the screen. The object of the app is to teach lessons about phonics, reading, and spelling. For more information read Common Sense Media's review of Wordball. 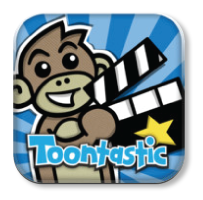 Toontastic is a creative learning tool that empowers kids to draw, animate, and share their own stories through imaginative play. Toontastic teaches key storytelling principles. Children are walked through creating the story arc: setup, conflict, challenge, climax, or resolution. Creating a story is as easy as putting on a puppet show — children simply press the record button, move the characters onscreen, and tell their stories. Once they're're done, Toontastic will play back their animation and voice as a cartoon for them to share with friends and family. For more information watch Toontastic in action.